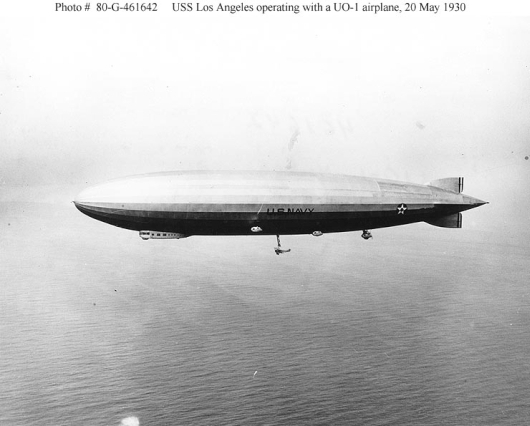 The USS Los Angeles, designated as the ZR-3 by the US Navy, was the first airship designed for intercontinental flights. At the end of WW I, British leaders sought to destroy the German airship industry since German airships had been used in WW I to conduct bombing raids on civilians. But the Zeppelin Company, on the other hand, with a vested interest in their program and skills, under the guidance of Dr. Hugo Eckener, negotiated a deal where the LZ-126 then under construction at the Friedrichshafen plant, would be completed and delivered to the US as part of German war reparations. The LZ-126 would not carry armament, and would be built solely for civil purposes. Since the British R-38 had crashed, and was supposed to have become the US airship #2, the British reluctantly agreed to the plan. Construction of the ZR-3 was at Friedrichshafen, Germany. She was completed in August 1924 and delivered to the US NAVY in October. She was 656.2 feet long, 90.68 feet in diameter, with a maximum speed of 79 mph. Power was by 5 Maybach 12-cylinder engines. She had a range of 5770 miles. 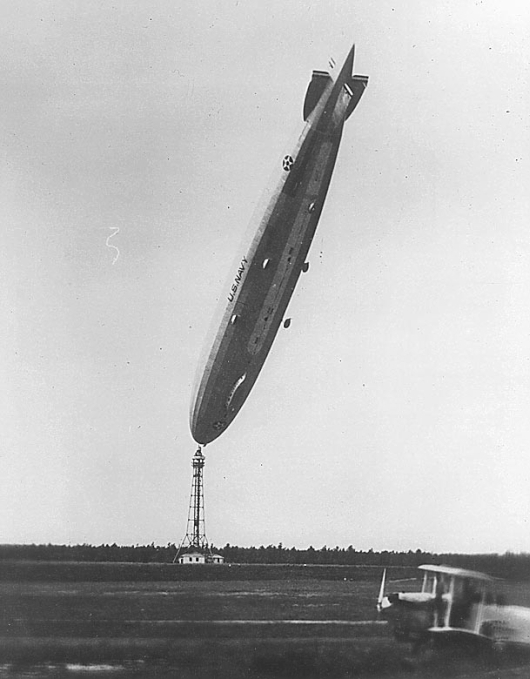 Upon receipt by the US Navy at Lakehurst, NJ, the hydrogen lifting gas was removed and replaced with helium. She was commissioned the USS Los Angeles on 25 November, 1924, and began service primarily as a test and demonstration vehicle to evaluate commercial and naval use. During her nearly 15 years of service, she made 331 flights, and logged 4,398 flight hours. During her operations, since helium was expensive and in short supply, the Navy shared the helium with the USS Shenandoah. While one ship was in repair or overhaul, the helium would be transferred to the other ship. This sharing technique suffered a serious blow when the Shenandoah crashed in Sept, 1925, and the Los Angeles remained grounded from June, 1925 to March 1926. She went on to fly until 1932 when she was decommissioned in a period of fiscal difficulties. Her final flight was 24-25 June, 1932. She was re-commissioned for a time in 1933 for non-flight operations after the USS Akron crash in April that year. 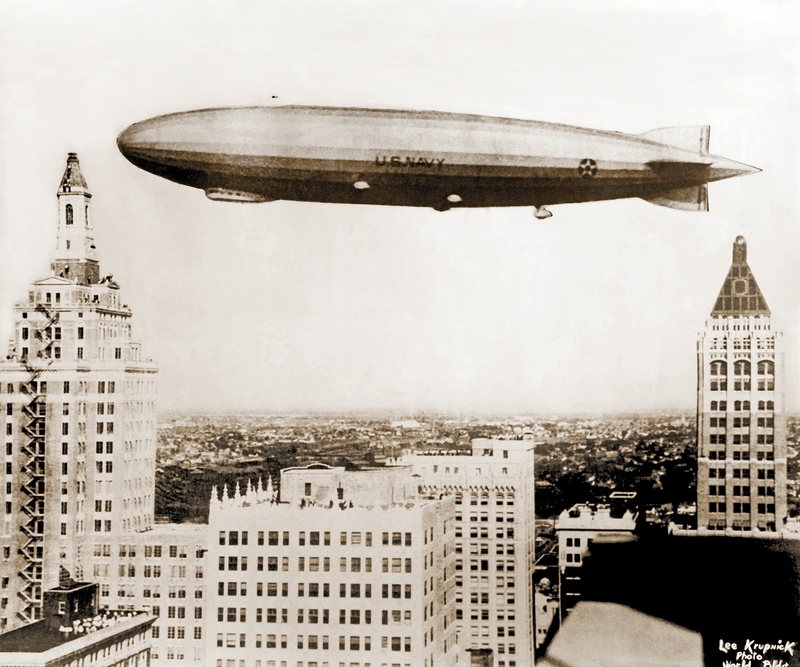 Unlike most other rigid airships which met their fate by disastrous crashes, the USS Los Angeles shares a successful operational record with that of the Graf Zeppelin. 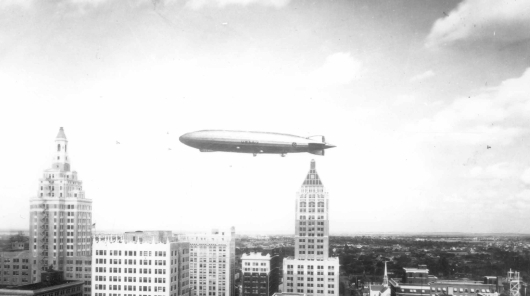 Both of these great airships were taken out of commission and dismantled due to the fading interest in airships, and the difficulties in obtaining popular support for them after the spectacular and infamous explosion of the Hindenburg in May, 1937. The USS Los Angeles was placed in storage in the Lakehurst airship hangar from June 1932, to sometime in 1934 when she was used for non-flight tests and mooring experiments. The last time the Los Angeles was removed from the hangar was in November, 1937. In October, 1939, she was removed from the list of US Navy vessels, known as being "stricken". By the end of 1939, the USS Los Angeles had been reduced to scrap. During the years of successful operation, the USS Los Angeles was based at Lakehurst, NJ. On 25 August, 1927, while moored at the High Mast, a gust of wind caused her tail to rise, rather than to cause the airship to pivot to point into the wind. That lifted tail, now in cooler, denser air, caused enough differential in lift between the nose of the airship and the tail, that the tail just kept on rising! This was all caught by photographs, and a series of shots show the progression as the tail rose to as high as 85 degrees before finally descending again. 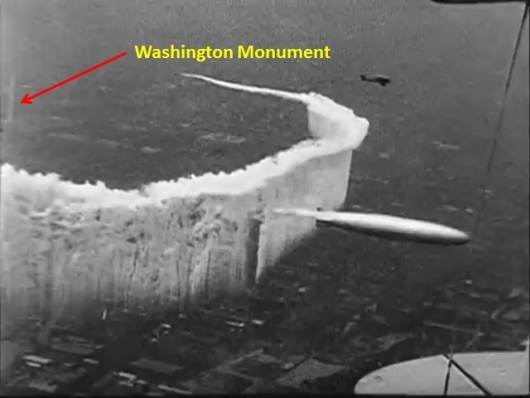 Photo credit: Navy Lakehurst Historical Society. As interesting and fascinating as this incident was, my question was: "Where was this high mast?" Well, the High Mast is long gone, of course, but it was a fun bit of sleuthing to find where it was! 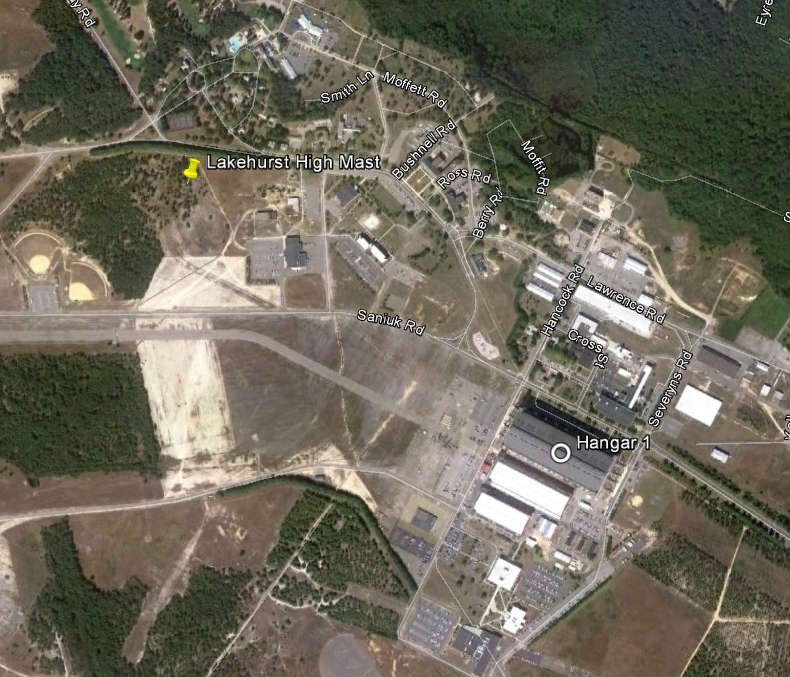 Turns out it was at (Lat Lon) 40.034324 -074.326045. (Click here to View in Google Maps). 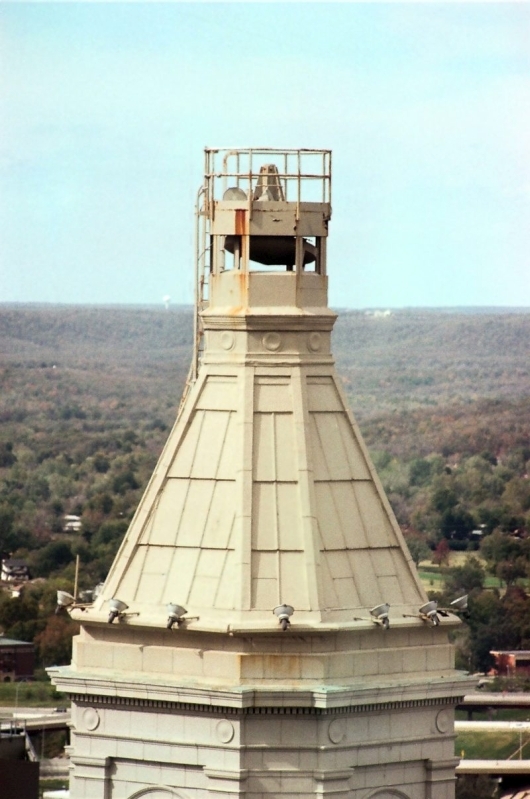 There is a nice discussion about the High Mast at http://www.nlhs.com/highmast.htm though they stop short of revealing exactly where the mast was. However, I found it in Google Earth, and confirmed it eventually by identifying some other web sites which had also located the High Mast. In the photo above, the map tack is at (Lat Lon) 40.034324 -074.326045. (Click here to View in Google Maps - same link as above). The High Mast was not directly out the west door of Hangar 1, rather, it was off slightly to the north. 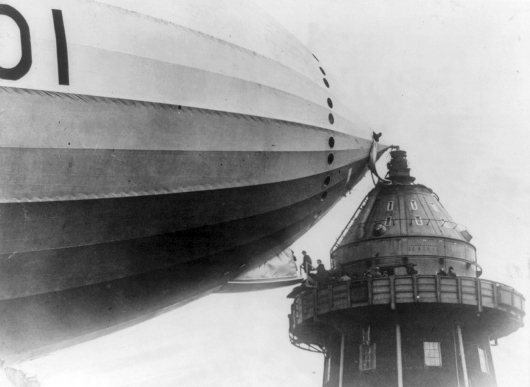 Interestingly, since the High Mast was fixed, and airship, to be moved into the hangar had to disembark from the High Mast, only to then fly to and be captured by a portable mast to be hauled into a hanger. The USS Los Angeles accident in August, 1927, caused the US Navy to reconsider the safety of a high mast, and they opted to go with the shorter "stub" mast for later airship operations. 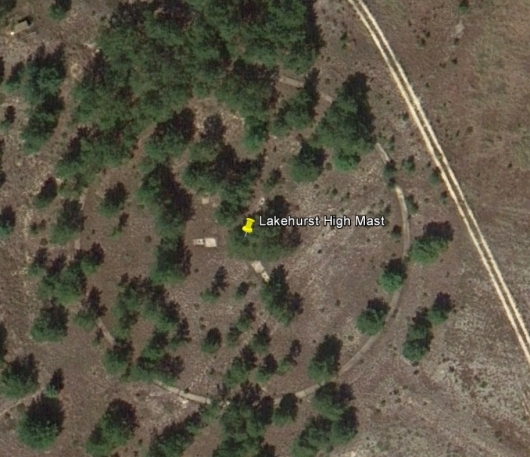 Above, a close-up courtesy of Google Earth, of the location of the high mast. In this next photo, from 1930, we see the Los Angeles over Boston. It's a great photo, and when compared to Boston today - my how things have changed! I find many features that are the same from buildings to landmarks. But I also find MUCH that has changed. 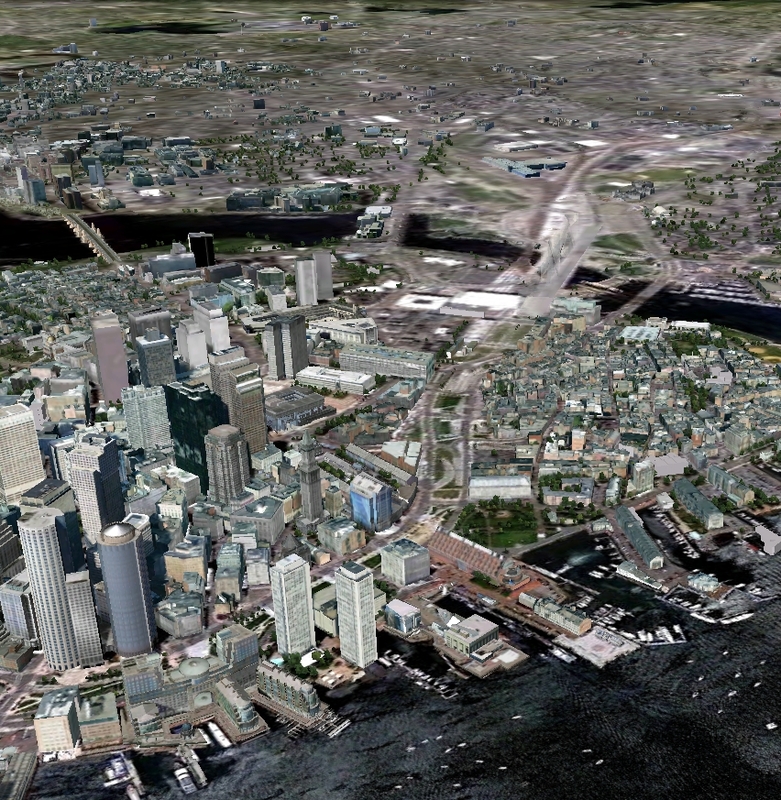 The center of this image is at about (Lat Lon) 42.359448 -071.0501978. (Click here to View in Google Maps). In this next photo, from 1928*, we see the Los Angeles over Tulsa Oklahoma It's also a great photo, and when compared to the Tulsa skyline today, many of the buildings in this photo still exist - and there is an exciting finding about one of them! I find several buildings in this Google Earth representation which are the same as in the 1928 photo. 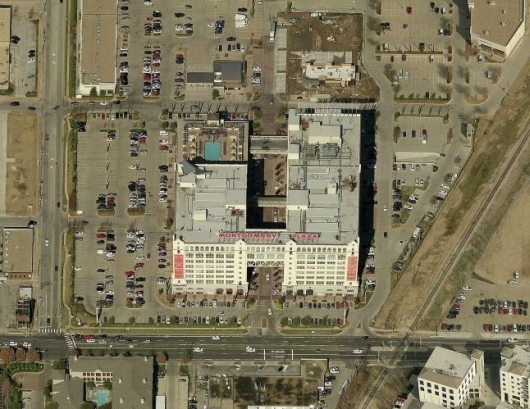 Most prominent, the tall building on the left was built in 1917 and was known as the Exchange National Bank of Oklahoma. 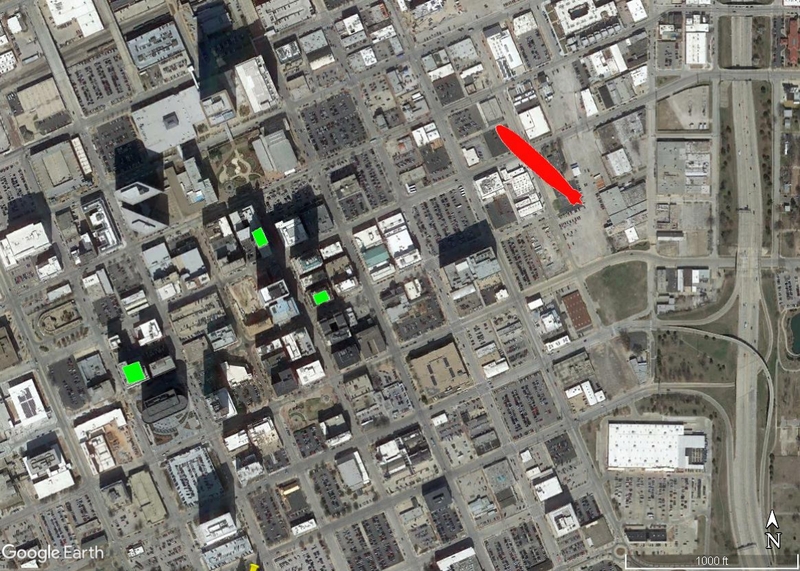 It is at 320 S. Boston St, Tulsa. The 22 story central tower was added in 1927-28. 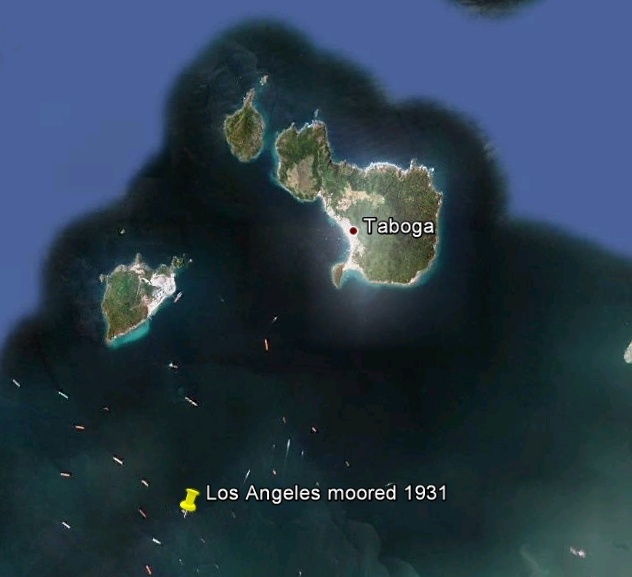 The red shape near the top of this image is, of course, the USS Los Angeles, and the 2 green rectangles in the center are the two prominent towers in the 1928 photo. The green rectangle at the lower left is the Mayo Hotel, from which the USS Los Angeles photo was taken. The USS Los Angeles itself is at (Lat Lon) 36.154411 -095.984586, over S. Frankfort Ave and E 4th St., (Click here to View in Google Maps), which I estimated was at about 1200 feet in altitude, and 1500 ft beyond the two towers. 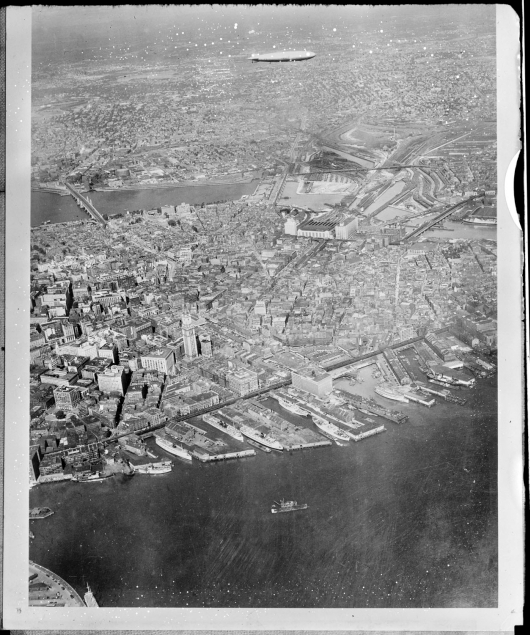 Now this is interesting: The two towers, the Exchange National Bank and the Philtower, are only 492 feet apart, yet the Exchange National Bank central tower had just added a new feature added in 1927-1928 - the spire was reportedly to be a mooring tower for airships! 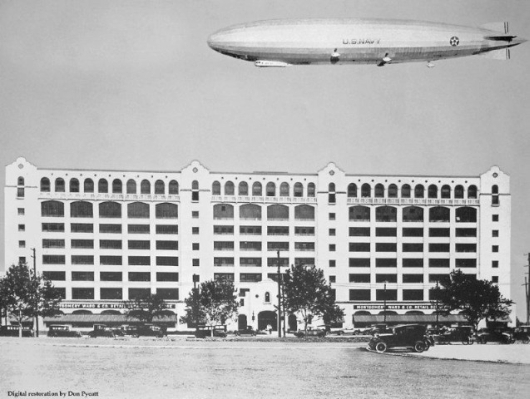 Just as the Empire State Building, and the Industrial Trust building in Providence, RI, the building of the "National Bank of Tulsa", as it was known then, was to be an Airship dock. It is unlikely the USS Los Angeles was making this visit to the Tulsa area because of the (presumed) mooring on the bank building, though it is clear that the Los Angeles did not attempt mooring with the mast at the top of the bank (if it was a mooring! ), because the Los Angeles was 656 feet long! This means that the tail section, if the mooring was permitted, could have impacted the top of the Philtower under unfavorable wind conditions! 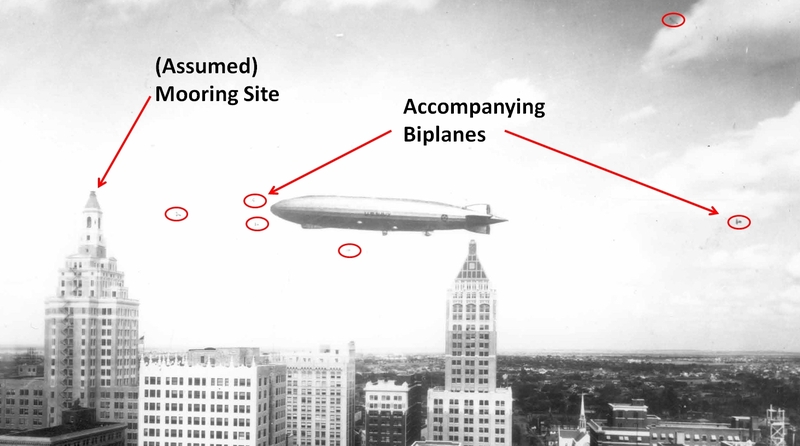 I did find several references making the (same) claim that a US Navy Zeppelin moored there in the 1930s, but they don't say what airship it was, nor was I able to find any truth to the claim. I'm guessing that plans to moor Airships on the tops of buildings, by this time, 1928-29, was already abandoned nationwide. It would have simply been too dangerous. 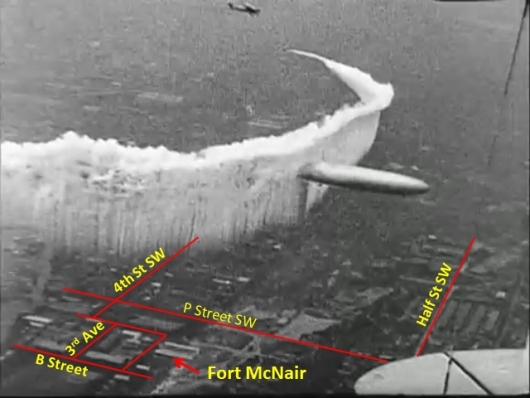 The truth is, the Los Angeles was passing through Tulsa only because it was on its way back to Lakehurst, NJ from an intentional visit to the Helium Plant in Fort Worth, TX. April 2015 update: I have finally seen photos of the inside of the tower of the 320 Boston Building. Richard Clark, of Channel 6 in Tulsa was fortunate enough to be provided the opportunity to see the inside of the tower and take photographs. (Link to his 2015 story.) I am sorry to say that the photos show absolutely no evidence whatsoever that the tower was ever intended as an airship mooring. If the tower had been designed for embarking and disembarking passengers, there would still today be evidence of something! Remnants of a grand staircase, or a trap door to the pinnacle for the ground crew to feed cables, or anchor points for heavy machinery including winches, or something to suggest the area was once "finished" so the wealthy airship passengers could ascend and descend safely in grand style. Alas there is nothing remaining but the myth. October 2018 Update: In the summer of 2018, Richard Clark, of Channel 6 in Tulsa made a trip to the National Archives and reviewed the actual flight records of the Los Angeles. (See "90 Years Later: Records Deflate Legend Of Tulsa Airship Mooring".) What he found convinced me that the Krupnick photo is a composite of two photos. 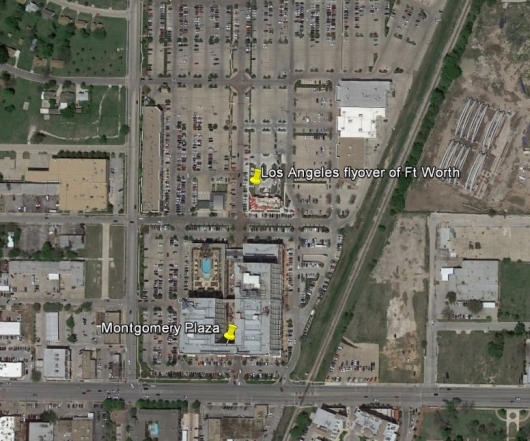 The Los Angeles flight record shows she only passed over Tulsa, it did not stop, it did not circle the city. I had previously assumed she circled the city to explain the different perspective of the Los Angeles between the Kupinick photo and the photo published in "This Land Press". The difference in perspective, I assumed, was attributed to a couple of hours time difference when the two photos were taken. 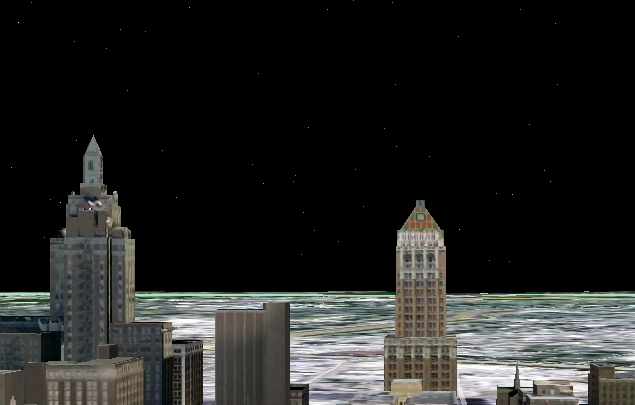 However, given this new evidence, it now seems that Mr. Krupnick made a photo composite, overlaying a print of the Los Angeles over a print of the Tulsa skyline. This would also explain the many visible differences between the two photos such as the American flag present in the This Land Press photo while the flag is missing in the Krupnick photo. From what I've read, the large windows at the top of the bank tower, visible in this photo taken from the south, were on three sides, but the fourth, the north side, was not a window, rather it was a door! So the presumed intent was, possibly, that once moored, the gangway from the Los Angeles would be lowered, and that door would be the entrance to the tower by the passengers. Of course, the Los Angeles never moored here as by this time, mooring on commercial towers, high above the ground, was clearly understood to be a bad idea. Add to that, the predominant winds in Oklahoma shift often, so a mooring only on the north side of the tower would have been a bad idea in the first place! Perhaps doors should have been provided on all 4 sides, or better yet, a completely circular access the way the British did it (see below)! No modern "thrill ride" today can top the sweaty palms one would feel when passing on a narrow and dangerous pathway as this! Oh man! I can't imagine the shear terror being felt at this moment by the unknown man in this photograph*, shot just moments before he had to step from the security of the tower to the platform of the airship with NOTHING stopping him from plummeting to his death if the gap suddenly changed due to winds, or human error! And they planned this sort of ingress and egress from the tops of buildings all over the country! In this next photo, from February 1931, we see the Los Angeles moored to the USS Patoka during her flight exercises with the US Navy during "Fleet Problem XII". The shot, though over water, was not too hard to locate since the islands in the background are visible. 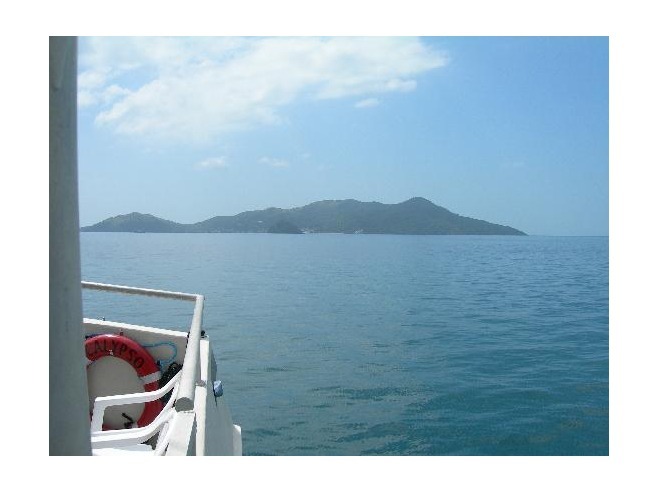 For comparison, here is a shot taken from a tourist boat, the "Calypso", found at "VirtualTourist", which clearly shows the main island of Taboga. You can make out part of the profile of the island in the 1931 Navy shot, above, (under the words "off Panama"), and see that the two shots are roughly from the same spot! 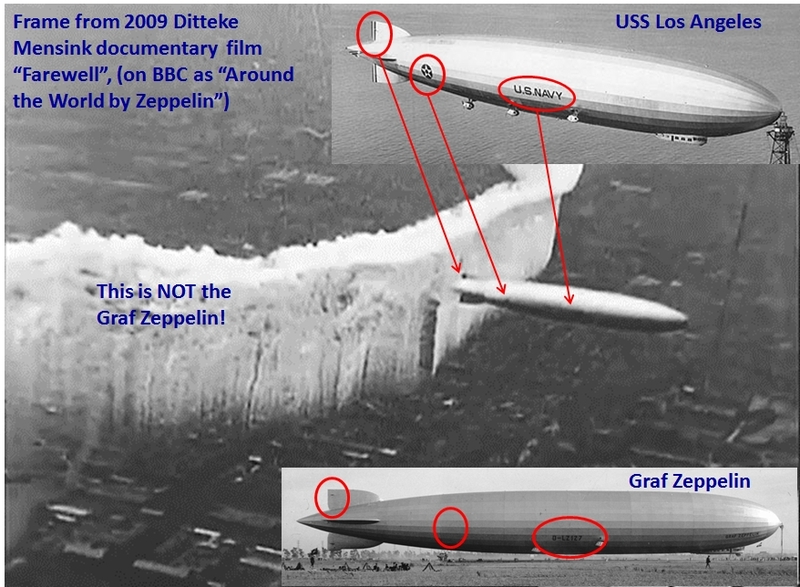 I found a great 2009 Ditteke Mensink documentary "Farewell" (shown on BBC TV in 2010 as "Around the World by Zeppelin"), the Aug 1929 world trip by the Graf Zeppelin, which showed a fascinating few seconds of video where a biplane is dropping a smoke screen, with the Graf Zeppelin is passing through the smoke. 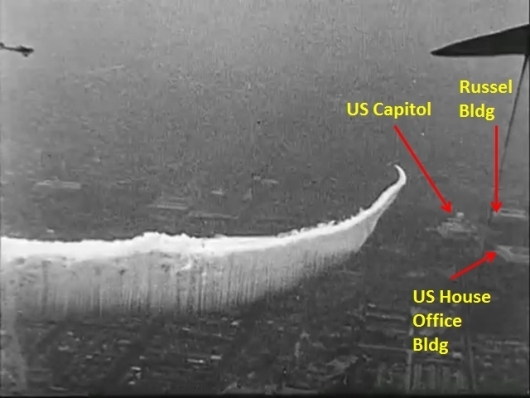 A few seconds from that archival video, reproduced here is most often described in other on-line videos as the "LZ 127 Graf Zeppelin returns to New York after world tour 1929", yet the scene in question, I discovered, was not in New York, but was over Washington DC! Then, in April, 2015, Mr. Fancisco Carvallo contacted me to say that the airship in this scene from the movie was actually the USS Los Angeles (ZR-3)! I quickly looked carefully at the video and validated he was correct! Thank you Mr. Carvallo! So the USS Los Angeles passed over the area of Ft McNair, and close to, if not right over, what is today the Washington Nationals baseball stadium! I will endeavor to determine the date that this flight took place. In this frame, we see the airship has emerged from the smoke. Though not well-resolved, there are 3 key areas which match the profile of the USS Los Angeles as the USS Los Angeles was configured during the entire time frame when this event must have happened. First, the rudders were painted in a red, white, and blue stripe which explains the "dark" color of the rudders in the video frame, while the Graf Zeppelin had no dark coloration of the rudders which might match the video. Second, the roundel (the white star with the circular blue background of pre-WW II aircraft) can just be made out in the video while the Graf Zeppelin had no marking in that area of the envelope. Third, there is clear evidence of large block lettering in the middle of the side. 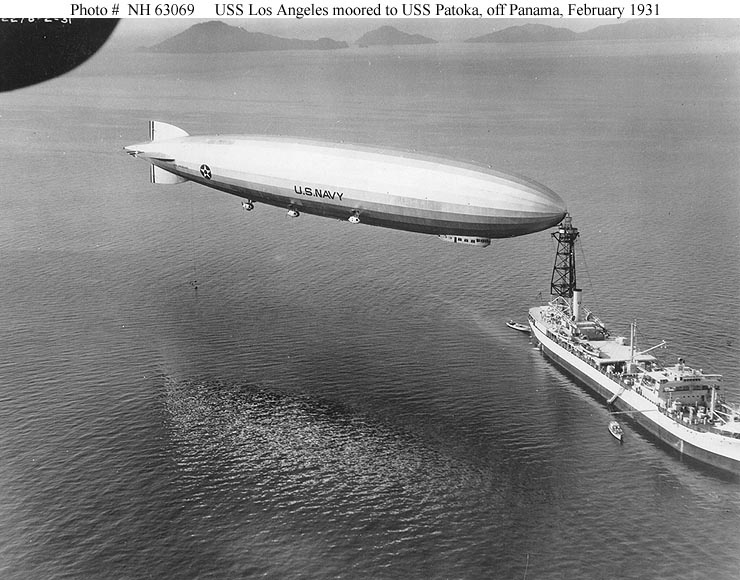 The USS Los Angeles was emblazoned with the words "U.S. NAVY", while the Graf Zeppelins displayed a somewhat smaller, and below center "D-LZ127". The position of the printing in the video definitely suggests "U.S. NAVY". In this frame, which appears in the documentary a few seconds before the smoke screen scene, the windows of the crew gondola are clearly visible. Upon comparison of the gondola windows of both airships we immediately see that the windows only match the USS Los Angeles. There are two other obvious, visible differences which could be used in this video to assess the airship identity, but the quality of the documentary which I was able to obtain is not sufficient to rely on them. 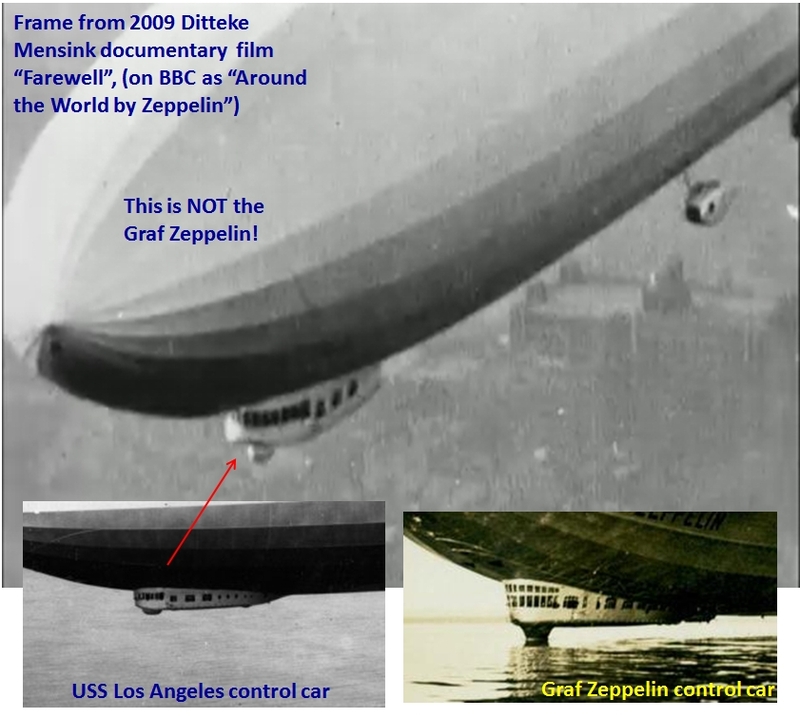 First, as Mr. Carvallo pointed out, the control gondola in the Graf Zeppelin is longer than the USS Los Angeles, an second, the upper vertical fin on the Graf Zeppelin is larger and more rounded on the forward edge than the Los Angeles. But neither of these characteristics were clearly seen in the video so I could not rely on them to help with the assessment. Nevertheless, many thanks to Mr. Carvallo for the tip! Assessing this further was a real joy!